CATS RULE! 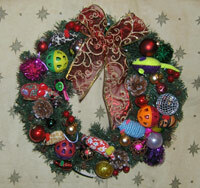 Feline Rescue - Holiday Wreaths! 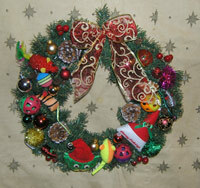 Our fabulous KITTY WREATHS are BACK! 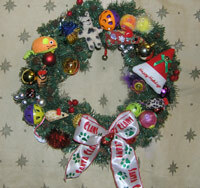 And this year, for the first time, we have wonderful DOGGIE WREATHS, too! Exclusively at CR!FR! Each wreath is topped with a beautiful fabric bow & adorned with colorful cat or dog toys, red & silver bells, pine cones, mini-presents & -candy canes, red berries, & other festive ornaments. 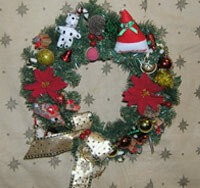 The dog wreaths also feature dog biscuits. 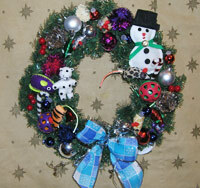 Each 24" wreath is handmade in the USA by our creative team of rescue volunteers. Each wreath is unique, no two are the same. 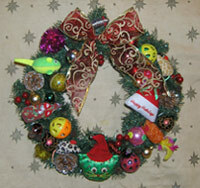 Our handmade Kitty Wreaths are one-of-a-kind! Each is unique. They are available starting in October every year. If you would like one earlier, please get in touch!